The CBJ led the game late into the third period, 2-1, then Bobrovsky got injured, and then they gave up a late goal to send it to a 2-2 overtime. The Kings prevailed in the last minute of 3 on 3 overtime to make it a 5 point season series. However, the Jackets took 3 of the 5 points, we don't care about how the Kings finish in the Western Conference, and in the long run of the season this is an okay result. This is a very powerful Kings team. I have to wonder if the Blackhawks could have won the Cup last year if the Kings would have made the playoffs. Certainly Quenville would not have been able to get away with playing 4 defensemen in a 7 game series against the Kings. But, as Dandy Don Meredith always said, if "Ifs and Buts were Candy and Nuts we'd all have a Merry Christmas". The Kings outplayed the Jackets for large stretches of the game, but the Jackets held the lead on a couple of opportunistic goals. 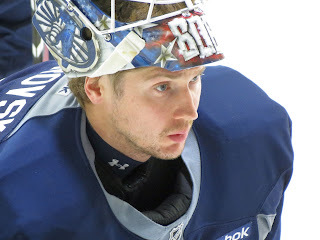 The Jackets held on based on the strength of excellent play by Bobrovsky. But with 5 minutes left in the game he went to the locker room, and Curtis McElhinney came in cold. CMac did well, but the Kings end up pulling it out. In the 2013-14 season, Bob went down right about this time of year in a game at Phoenix. The CBJ ended up making a strong run at that point in front of CMac, and ultimately made the playoffs. We have been riding Bob like a rented mule. When we do that, he gets hurt. You just have to start managing his minutes better, resting him on back to backs, instead of playing him against Mason in Philly. I don't blame Torts, he doesn't have the historical perspective, but this is like the third year in a row that Bob gets hurt in December. Of course the last three years we have been behind the 8 ball by December already in every year, so the poor starts really hurt us there. We will find out later how bad it is with Bob, but CMac will be playing for a bit now. Time to get him some goals to work with.